SAULT STE MARIE – Trevor Letowski says his first season behind the bench for the Sarnia Sting has been one of ups and downs. 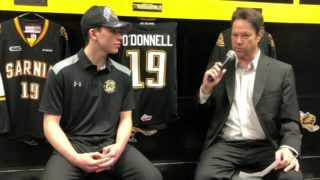 As the Sting played their final game of the season in the Ontario Hockey League Saturday night, Letowski reflected on what has taken place over the year. Letowski joined the Sting as an assistant coach, but has been interim head coach for the past 18 games after Dave MacQueen was fired in early February. Sarnia finished 7-11 under Letowski, including a 5-3 victory over the Sault Ste. Marie Greyhounds Saturday night before 4,587 fans at the Essar Centre. Letowski, who turns 34 next month, says he likes his new role. Letowski played 600 career games in the National Hockey League and also spent time playing in Russia before joining the Sting. He says playing for certain coaches was of great benefit to him as a player and now a coach. He admitted he took over as head coach in a tough situation with the team all but out of the playoffs. He says he has enjoyed working with Alex Galchenyuk Sr. and Derek DiMuzio and would love to see those two return as assistant coaches next season. The Sting won just nine of 34 games this season, the second fewest in the entire league. Last night’s game was the final one for three Sting players, Kale Kerbashian, Tyler Peters and Troy Passingham. Kerbashian put the finishing touches on a five-year OHL career that included two years in Sarnia along with time in Mississauga and London. 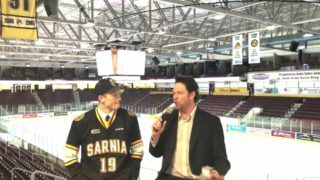 Peters, a Sarnia native, played two years with the Sting, signing as a free agent while Passingham played just two months with Sarnia, coming over in a trade with Windsor. 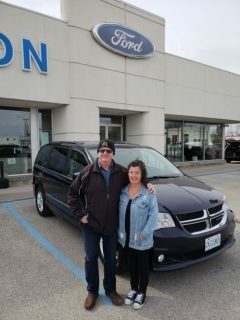 He spent two years in Windsor as well as a year and half with St. John’s in the Quebec Major Junior Hockey League. Kerbashian, who was second in team scoring this year with 37 goals and 51 assists for 88 points, would like to continue his hockey career in the pro ranks. He could be headed for Russia, as early as Monday to join a team in the Kontinental Hockey League. Passingham may land a spot with an East Coast Hockey League team this year. He also may go to a Canadian university next season. Peters finished the year with 21 goals and 40 assists for 61 points. Yakupov assured himself of being OHL rookie of the year, as he becomes the first Sting rookie in team history to reach the 100-point plateau. He had a goal and two assists to finish with 49 goals and 52 assists for 101 points. Galchenyuk had three assists to cap his rookie season with 31 goals and 52 assists for 83 points. In his final 15 games, Galchenyuk chalked up 27 points while Yakupov had 23 points. Yakupov and Galchenyk are already projected to go one-two in the 2012 NHL Draft. If that happens it will mark the first time in league history one team has their players go first and second overall. Yakupov will return to Russia next week, but already has return ticket to Sarnia stamped for August 18th. Galchenyuk, who lives in Sarnia with his family, will travel to Russia for the month of June to visit his grandparents. In last night’s game, Peters had two goals while Yakupov, Craig Hottot (14th) and Garrett Hooey (8th) scored for the Sting. Colin Miller, Vern Cooper and Nick Cousins replied for the Greyhounds. Sarnia led 3-1 after the first period and 4-2 after the second period. Passingham got the win in goal for the Sting as Sarnia held a 30-25 edge in shots on goal. Sarnia finishes the season in ninth place in the Western Conference with a 25-36-5-2 record. (That’s eight more victories than a year ago). 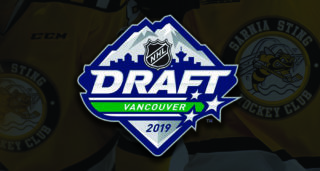 As a result Sarnia will pick fourth in the 2011 OHL Priority Draft on May 7th. Sarnia won six of eight meetings with Sault Ste. Marie this season. Dave Borody is a freelance writer who covers Sting games both home and away and also does features for the Sting Website.